How much do Rose Bowl suites cost? Rose Bowl suite prices will vary based on the who the matchup is that year, where the suite is located and the amount of tickets included. Prices have ranged from $25,000 - $75,000. This Rose Bowl suite includes 20 tickets. Your party will get private venue entrance, exclusive access to VIP clubs inside the Rose Bowl and the option to purchase premium in-suite catering. This Rose Bowl suite includes 30 tickets. Your party will get private venue entrance, exclusive access to VIP clubs inside the Rose Bowl and the option to purchase premium in-suite catering. This season, the Rose Bowl is one of the Semifinal Games for the College Football Playoff (CFP), and the winner of the Rose Bowl will be one of the two teams playing for the National Championship. The Rose Bowl takes place on New Year’s day in Pasadena, California in a battle of the PAC-12 versus the Big Ten. This season's Rose Bowl hosts the #3 Georgia Bulldogs against the #2 Oklahoma Sooners. A private luxury suite at the Rose Bowl will provide fans with the ultimate VIP experience. From VIP parking to exclusive access to the VIP clubs in the Rose Bowl, suites are the perfect way to entertain clients or friends and family. Rose Bowl suites can accommodate groups of 20-30 people. The Rose Bowl takes place on New Year’s day in Pasadena, California in a battle of the PAC-12 versus the Big Ten. It’s Stanford vs. Iowa. The Hawkeyes are given the tough task of containing Heisman Finalist Christian McCaffrey. McCaffrey has been one of the country’s best offensive players. McCaffrey will be seen out of the backfield, out wide and even at quarterback during games. Iowa has a stout defense and will focus on stopping McCaffrey but so far there hasn’t been a team that was able to do that. Behind center for the Cardinal will be Kevin Hogan. Hogan isn’t one to fill up a stat sheet but he has been very efficient running the offense. For Iowa, quarterback C.J. Beathard has been pleasant surprise. Beathard led the Hawkeyes to its first 12-0 start in school history. Iowa’s rushing attack comes from Jordan Canzeri. While battling injuries for most of the season, Canzeri managed to score 12 touchdowns. Iowa isn’t one to score a bunch of points, their strategy is to not allow the other team to score at all. Stanford is facing the toughest defense they’ve seen yet and will rely on McCaffrey to lead them to a Rose Bowl victory. Don’t miss your chance to see the first ever College Football Playoff Semifinal game at the Rose Bowl. The game takes place January 1st in Pasadena, California. This will be the 101st Rose Bowl game. This game will feature two top teams as selected by the College Football Playoff Selection Committee to compete for a spot in the College Football Playoff Championship. A private luxury suite at the Rose Bowl will provide fans with the ultimate VIP experience. From VIP parking to exclusive access to the VIP clubs in the Rose Bowl, suites is the perfect way to entertain clients or friends and family. Rose Bowl suites can accommodate groups of 20-30 people. With the College Football Playoff Semifinal game taking place at the Rose Bowl, this game is as important as ever. The Tournament of Roses is one of the most anticipated BCS bowl games in the country. 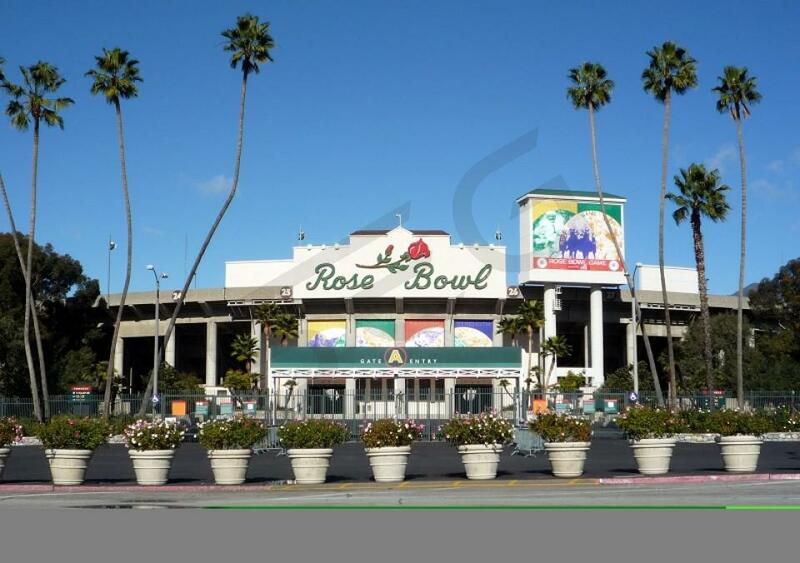 The Rose Bowl in Pasadena, CA features the tops teams from the BIG Ten and PAC-12. That could mean a must-see matchup of the Ohio State Buckeyes versus the Stanford Cardinals. Ohio State, led by their coach Urban Meyer, are third in the BCS Standings but right behind them in fourth are the Cardinals. Thank you for signing up for specials at Rose Bowl Stadium. Enter your email address below to stay in touch. We'll sign you up for our newsletter, which will inform you of the latest inventory and events at Rose Bowl Stadium. We promise we will never sell or distribute your information. The seating chart below shows where the Rose Bowl suites at Rose Bowl Stadium are located.